friendly atmosphere and is located in the heart of downtown Lockport. 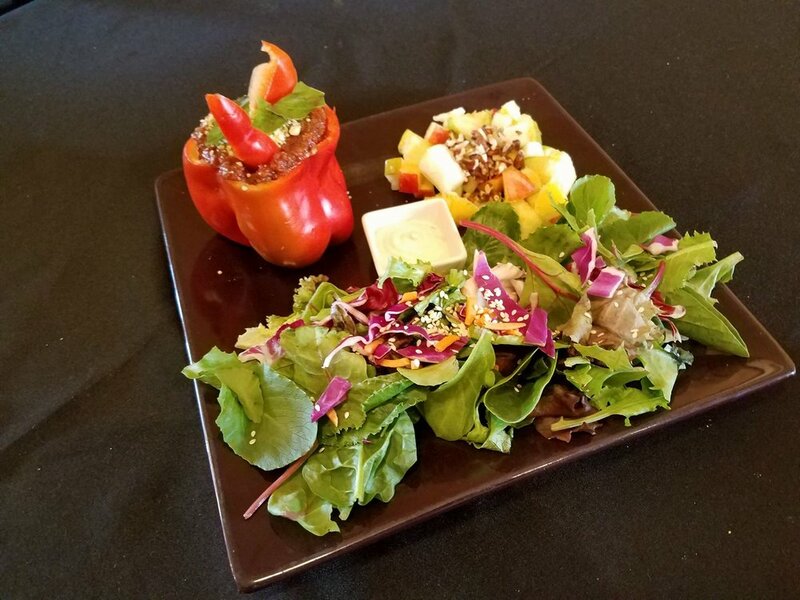 The Vegan Café is located in the heart of downtown Lockport amid the wonderful State Street shops and just a stone's throw from the I&M Canal. The Café has a laid back, friendly atmosphere and offers a wide variety of raw, organic, vegan, and gluten-free fare. Stop in for a full meal, grab a quick snack to-go, indulge in a dessert, or just pop in for a cup of coffee or tea and a chat. Our Vegan Cafe is based on "Celebrating Life." We strive to provide awareness that raw living foods and plant-based diets can aid in the healing of all diseases. Let food be thy medicine! 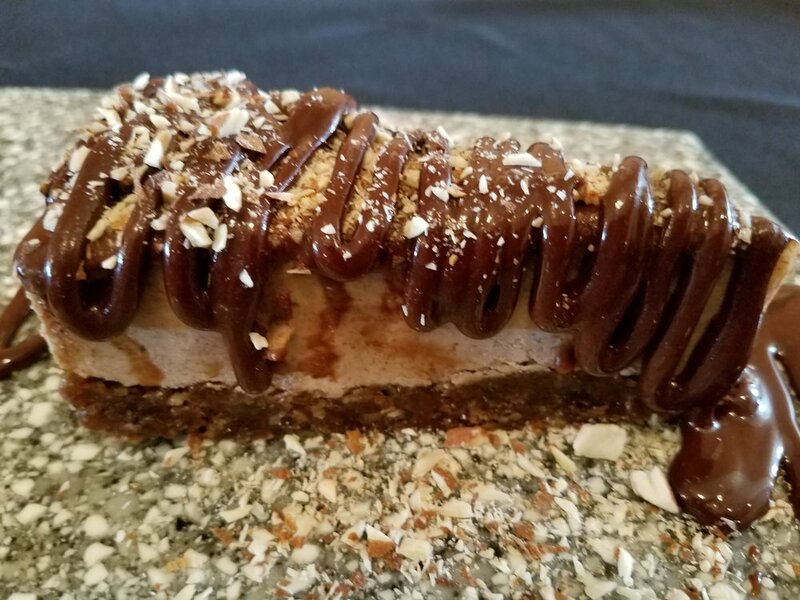 Our menu is completely raw, non-GMO, gluten free, and organic. In addition to our main menu, we almost always have daily specials. Item availability may vary based on seasonal ingredients. We cater to many health issues and concerns. Please ask if you have specific needs. We have food for everyone! Final seating is 30 minutes prior to closing. We also offer carry-out! Call ahead to place your order and we'll have it ready to go when you arrive. Dining with us often? You should check out our meal plans! Questions? Comments? Please get in touch! You can contact us via email, Facebook, or in person. Marguerite took ownership of the Vegan Café in September of 2013. An avid believer in the power of raw, plant-based diets, she has poured heart and soul into making the Café her own! Marguerite is first and foremost the owner of Healthy Sins Catering. 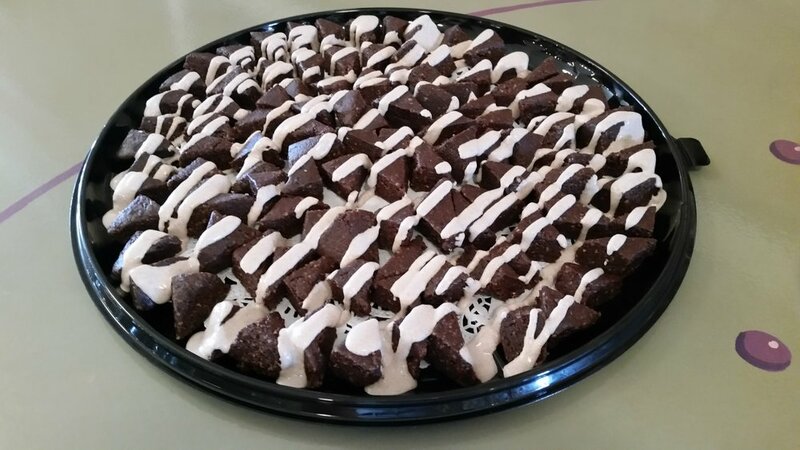 For more on catering by Healthy Sins and the Vegan Café, please visit the Catering & Parties pages. Corn and flax tortilla chips served with fresh avocado guacamole. Taco meat, guacamole, salsa, and onions, topped with nacho cheese drizzle and sour cream. Served with corn flax chips. Served with your choice of toppings (see toppings list). Try 6 for 9.95 or make it a meal for 15.95. Our signature sunflower/almond pizza crust served as bite sized squares topped with cashew cheese, marinara, mushrooms and fresh basil. Taco meat and guacamole served over a bed of spring greens, topped with sour cream and served with corn flax chips and a side of salsa. Spring greens and spinach topped with red bell pepper, celery, carrot, cucumber and green onion, finished with a garlic ginger dressing and sesame seeds. 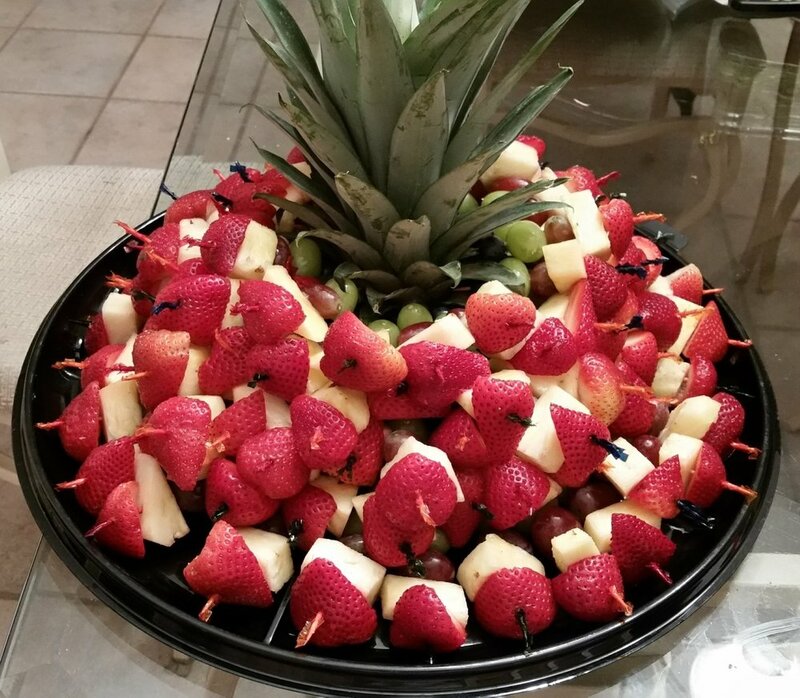 Choose from fruit salad with vanilla drizzle or tossed salad with garlic ginger dressing. Served over a bed of spiral cut zucchini noodles and topped with marinated mushrooms, chopped green onion, garlic powder and parmesean cheese. Add sundried tomatoes for 1.00 more. A creamy tomato sauce served over a bed of spiral cut zucchini noodles and garnished with fresh julienne sliced basil strips. Vegetable and nut-based burger served on our own flatbread with cashew cheese, lettuce, tomato, onion. Walnut and sundried tomato based meat, with a hint of sweetness, served open face on flatbread. A cashew and vegetable puree blended with flax seed to make our savory flatbreads. Served with cashew cheese, pumpkin seed cheese or pesto. A vibrant yellow cashew cream salad with celery, scallions, and diced red pepper. Served open face on a flatbread. Taco meat, guacamole and sour cream, topped with scallions, served open face on a bagel. Your choice of filling topped in a cucumber boat. Collard leaves wrapped with pumpkin seed or cashew cheese. Choose four additional fillings: cucumber, tomato, sundried tomato, onion, red pepper, carrot, celery, or zucchini. Marinated Portobello mushroom slices, fresh guacamole, cashew sour cream, and caramelized onions wrapped in a corn tortilla. A delicious almond based variation of the classic Asian favorite. Served over zucchini noodles with carrots, red cabbage, sesame and green onions. An open face burger layered with cashew cheese, caramelized onions, marinated mushrooms, carrot bacon, lettuce and tomato. Our classic burger topped with marinara, basil, marinated mushrooms, and Parmesan cheese. Taco meat, guacamole, and sour cream, wrapped in a corn tortilla. Served with a side of salsa. Thinly sliced zucchini with Italian cashew cheese, marinara sauce, and pesto, topped with tomatoes, basil ribbons and Parmesan cheese. Sunflower seed and almond pizza crust topped with Italian cashew cheese, marinara sauce, mushrooms, tomato, and basil leaves. Check our blackboard or ask our staff to see what seasonal or daily specials are available when you visit! Served Monday through Friday, 11 am till 2 pm. Includes a half order of any Entrée plus your choice of one side salad and brownie bite. Child-sized serving of any option from our entrees or house specialty. Choice of one side salad. A variety of fresh juices and smoothies, made to order by the Naked Sprout. See menu in-store for pricing and availability. A variety of local teas are available. See menu in-store for pricing and availability. You can now enjoy your favorite bottle of wine with a healthy and delicious dinner. We will provide the glasses; a small uncorking fee applies. day or all at once. Dine in or carry out. Call us at 815.838.4626 or stop in to sign up for your meal plan! * Please note that this plan is for individual use only and is not transferable. No expiration date. Classes are 60 to 90 minutes. Preregister for $30.00 per class. To register, please email rum96@comcast.net and type raw prep class on subject line. Please let us know what date you would like to attend in the email. You will receive an email confirmation. Payment will be taken on the class day. Group classes also available. Registration closes 48 hours prior to class. Contact Marguerite at 708/227-7177 with any questions. Healthy Sins, Inc. was "born" in June 2007. We've spent the last several years creating and perfecting recipes that allow you to stay true to your diet while still enjoying great flavors. enjoy your event—leave the rest to us! Menu changes seasonally. Please contact us by email for a full menu detailing vegan and non-vegan fare. The Café is available on Sundays to host your private parties! Be it a bridal or baby shower, birthday or graduation party, or business meeting, we have you covered. We are able to accommodate parties of up to 45 guests. 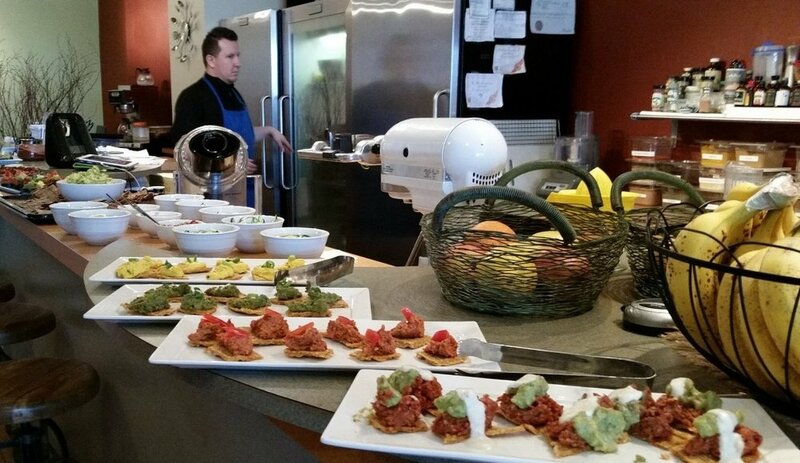 In addition to our raw vegan fare, a full service catering menu will be available to satisfy all palates. As mentioned, the menu changes seasonally. Please contact us for details and pricing.